Soak up beautiful scenery on this all-inclusive day tour to Isla Mujeres that’s easy on the wallet. 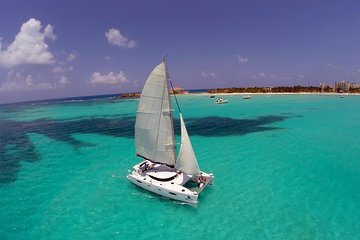 A catamaran speeds you across the Caribbean to a coral reef national park, where you’ll snorkel in turquoise waters and admire the colorful marine life that surrounds you. A beachside buffet lunch and a domestic open bar complete this all-inclusive Catamaran tour. Bonus: Round-trip hotel transport from Playa del Carmen is included. Board your catamaran at the Playa del Carmen marina and set sail into the Caribbean Sea to Isla Mujeres (Island of Women). En route, your boat stops at a coral reef national park. Slip on the provided snorkel gear and hop into the clear waters teeming with marine life. Your guide sprinkles in fish food, which likely will draw schools of exotic fish to your location. You’ll spend about an hour here. Continue to Isla Mujeres, and take in the sweeping ocean views as you enjoy your buffet lunch on the beach. Relax under the shade of a palm tree, and sip your drink from the domestic open bar. At this moment, life couldn’t be easier. This full-day trip includes pickup and drop-off from your Playa del Carmen hotel. This is only a three, because it was boat trip that was promised on Caribbean waters. However, we did not see any coral nor tropical fish. The liquor consumption was the high priority, but the food was not quality. Best Time Ever! The snorkeling was so much fun, the crew were happy and generous with the alcohol. The meal was very good, and the beach fantastic! All in all a day I will remember forever. P.S. Thank you for making me wear a life jacket, even though I insisted I'm a good swimmer. After I went snorkleing I realized, we absolutely needed them no questions. WE HAD A GOOD TIME BUT WOULD HAVE LOVED TO SNORKLE FOR A LOT LONGER AND IN SMALL GROUPS--A LOT OF CALLING OUT AND MOVING A LARGE GROUP. WE THOUGHT THE STAFF ON THE BOAT WERE ALL GREAT! Very misleading as it states the tour is from Playa del Carmen..No it's actually sailing from a Cancun Marina. Long time in transit 1 hour and 30 minutes to the dock with stops to pick up additional persons, and about 2 to 2 hours and 30 minutes time in transit for return trip. Snorkeling time was only about 20 to 25 minutes total and very rushed. The food and drinks provided were good for a buffet style lunch and the Captain and crew of the catamaran were very courteous. Shopping time that is provided when they go to opposite side of the island was Meh....would have preferred to skip that and get a chance to spend more time in water snorkeling. You can do this activity without purchasing this voucher because going through Amigo Tours is horrible. They do pick-up in Playa del Carmen and we were staying in Tulum. We had a clear understanding that we would show up at Marina Chac Chi, the departure point for the catamaran tour, at 9am if were unable to be picked up. So I call to confirm while we're on the way to the marina and the Amigo Tour rep makes it sound like I did everything wrong. He's like You missed pick-up time and I stated that we never set up a pick-up time/place because we knew we were not in the pick-up area. The voucher clearly states to meet at Marina Chac Chi if we aren't located near the pick-up area. Once we got there, I showed my voucher and the woman stated she couldn't find my reservation. Not sure what was going on there, but eventually she just gave us our tickets. We made sure to get there by 9am but didn't even start boarding the boat until 10am. The catamaran tour was wonderful though. I enjoyed the boat, the unlimited drinks, and stopping at Isla Mujeres. The snorkeling portion was too crazy because the amount of people in the water and all of us demanded to stay in close proximity to the boat. I'd suggest doing this tour by going to the marina and purchasing your ticket there. There is no need to purchase this voucher because dealing with Amigo Tours is a pain. This was more about drinking then actually snorkeling. When we were in the water we got to see great fish and wildlife but other than that not impressed with the tour. They made us get off on a island in our bathing suits and walk around for 3 hours. Making us feel like we had to spend money. It was a great time! You are picked up by shuttle van in Playa and driven to Cancun, which takes an hour or so. The boat was great and the crew were fantastic. We had a lot of fun snorkeling they provide the snorkeling gear you provide your own swim suit, towel and sun block -- lots of sun block. They start serving the alcoholic drinks AFTER snorkeling for obvious safety reasons. There was a professional photographer on board taking pictures you could opt to purchase or not. They let us off on Isla Mujeres for a while to shop and/or go to the beach on our own. The beach there is gorgeous! Then we sailed to another part of the island to the lunch buffet at the beach. The food was excellent. 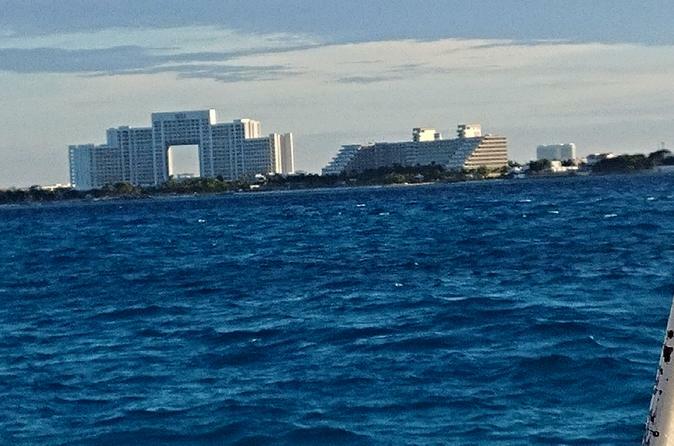 Then we sailed back to the marina at Cancun. Trying to find your shuttle van can be confusing as they all look alike, but they have people there with clip boards and lists to help. So just ask one of them which van is yours and they'll take you right to your van. It was an absolutely fantastic day! Good cruise but a little deceiving as it doesnt leave from Playa but the bus does which takes you to Cancun which is a 2 1/2 hour ride one way and you miss all that cruise time. The snorkeling was fair as they have made all the best spots parks and you cant go there anymore. Ship and crew were excellent however and some what made up for the minuses.